Looking for a great BBQ dessert recipe? We’ve got it! 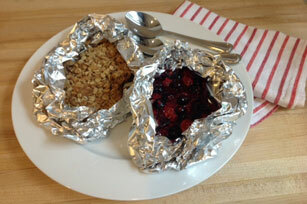 Our Foil-Packed Berry Crisp is oh so delicious! Cut foil into 5 (12-inch-long) sheets; spray with cooking spray. Mix first 4 ingredients in medium bowl until blended. Cut in butter with pastry blender or 2 knives until mixture forms coarse crumbs; spoon onto centre of 1 prepared foil sheet. Fold to make packet. Mix dry jelly powder and corn starch in large bowl until blended. Add fruit; toss to evenly coat. Spoon onto centres of remaining foil sheets; fold to make 4 packets. Grill all packets 15 min. Cut slits in foil to release steam; cool packets 15 min. Serve fruit topped with crumbled oat mixture. Prepare by using 4 cups of any combination of fresh berries, such as blueberries, blackberries, raspberries and strawberries.